"Beside The Sea" is situated in stunning Urquharts Bay-Paradise for swimming and diving. Fishing on the doorstep-cast out the net and catch your bait fish. Sit on the wharf and catch squid for lunch. Safe and calm waters perfect for paddle boarding and an enjoyable fun time for the kids. Many beautiful bays to kayak and explore. Take a hike over to Smugglers Cove, only 20 mins on foot and watch the dolphins. Climb Mt Manaia or the ridge across Mt Lion but don't forget the camera as the views are incredible. When evening comes, relax under the stars and watch the amazing colourful sunsets and if you're lucky you may hear the kiwis calling out. Enjoy total relaxing privacy or join your hosts Anni and Don on the deck or share a game of pool for fun. Ask Don for the local best fishing spots and Anni will guide you to the many artist studios that Whangarei Heads is famous for. "The Pines" golf course is only a 15 min drive and enjoy dinner at "The Jetty" at Parua Bay Pub on the way back. If you feel like a casual drink or meal then pop along to our local Mt Manaia Club (visitors welcome) and "Stan's Van" will ensure you won't need to drink and drive. Come and join us for your holiday at "Beside The Sea" but be warned--you may not won't to leave. We didn't and that's why we now live in "Paradise". it's fun to bring along your andquot;best friendandquot; so while we welcome your little doggie companion, the size andamp; breed of your pet would need to be considered. Please advise type of breed when enquiring for booking. We had a lovely time! The view is awesome and the owners were very nice. The accommodation is clean with a great theme to it. Would recommend. Thankyou so much for your wonderful comments. It was a pleasure having you stay and share our beautiful part of the the world. You were fabulous guests and your lovely dog was delightful and absolutely no bother. Hope to see you all again in the future. All the best, Anni & Don. Great accommodation close to beautiful beaches and fantastic hikes (tracks), Anni was a delightful hostess and we thoroughly enjoyed our stay. 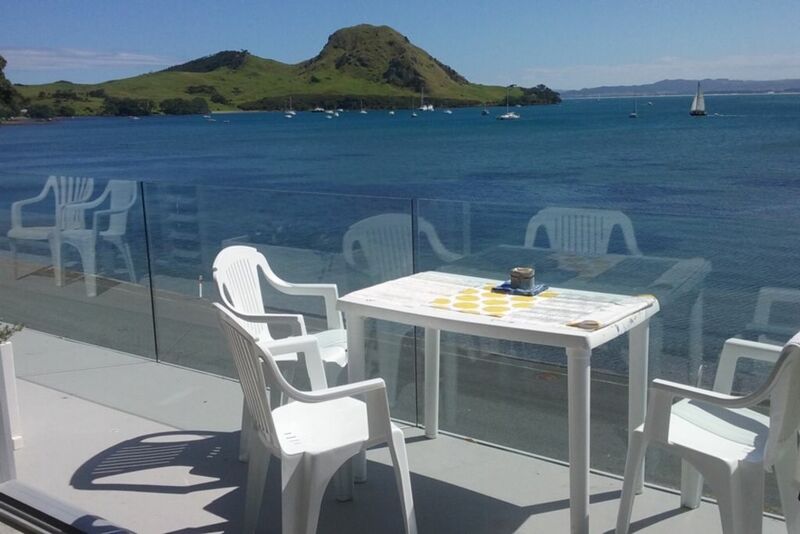 Such a lovely review...it's fabulous to share our Little Slice of Paradise with visitors from both N.Z & overseas.It's most definitely been a beautiful endless summer here "Beside The Sea". Had a lovely apartment. clean , modern, spacious , and excellent hosts. Highly recommend. Very nice place. The location is perfect-right across the road from the beach. The place is very modern and clean. The proprietors were very friendly and helpful. Having the use of the kayaks was very nice too.